A big part of Gretel’s active recovery from her back injury, caused by Intervertebral Disk Disease (IVDD), were rehab exercises prescribed by our veterinarian. They’re designed to improve her strength, balance, and body awareness. By doing these exercises, she is less likely to suffer re-injury. She’ll also be a stronger hiker for it. Disclaimer: I’m not a vet. I worked with a dog rehab vet and a dog fitness trainer to determine which exercises to do and how to do them properly. Please check with your veterinarian before you start any new exercise routine with your dog. 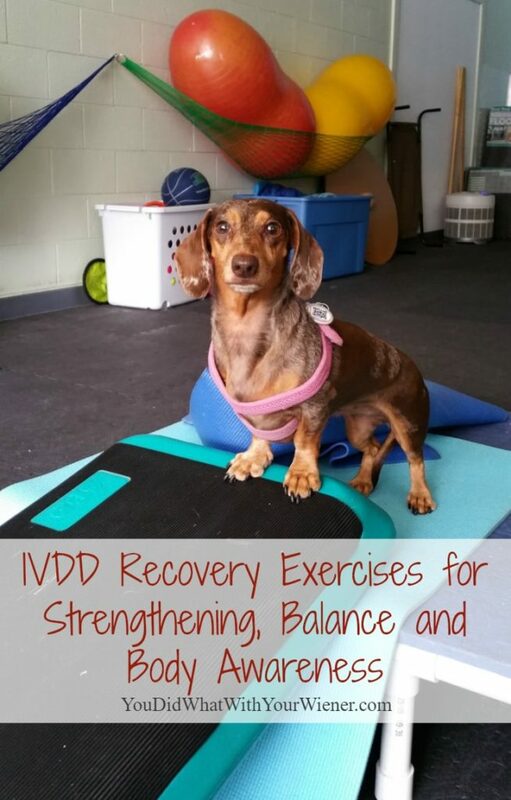 Because IVDD is a genetic, degenerative spinal disease, these exercises won’t guarantee that there won’t be a re-occurrence. There is a 20% chance that disks not involved in the initial injury can bulge or rupture. However, making Gretel stronger and more flexible can help support her spine, increase circulation to the disks, teach her proper body mechanics so that she is not putting undue stress on her spine, and help to keep future episodes mild. All of these exercises can be done at home if you have the right equipment. Note: many of the links in this article are affiliate links. That means when you click on a link and make a purchase, I will receive a few pennies to help maintain this website. I don’t have enough space in my house to leave them set up all of the time (I wish!). Instead, I have to stack them in the livingroom and set them up each time we want to use them. 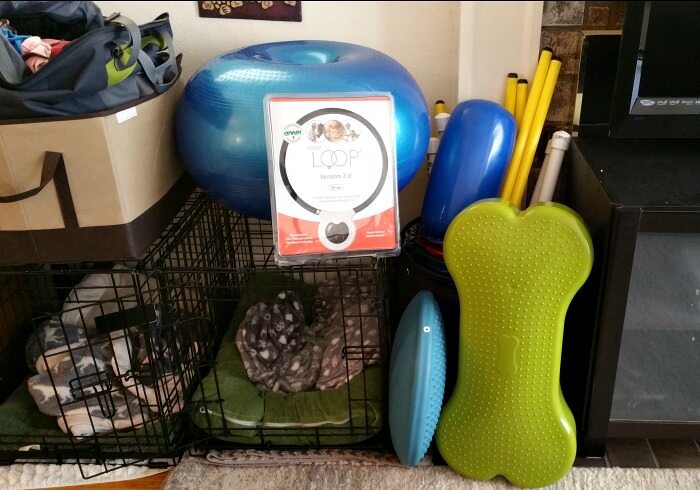 If you can, make a space in an extra room and leave them out while your dog is still doing the exercises regularly. That will make it so much easier to fit them into your daily routine. Our rehab vet quickly demonstrated how to do some of these exercises with me and gave me a sheet of instructions. I tried doing them all at home myself in the beginning. I am impatient though. Gretel is a smart dog, and the things I have “trained” her to do up to this point were simple, so I was used to her just “getting it” right away. I don’t regularly work on training with Gretel though I had a hard time communicating what I wanted her to do and she had a hard time doing them properly. The fact that she would do the exercises ok when the rehab vet demonstrated them, but it just wasn’t working when I got home, frustrated me and made me want to give up. I decided to enlist some help. I started taking Gretel to a doggy gym once a week. We see J Linn at the Splashdog Canine Well-Being Center in Edmonds, Wash. and it’s really helped. She was able to take more time with me than the rehab vet and really determine a method that worked for me and Gretel to get her to do the thing. She first taught Gretel how to do the exercises and then taught me how to do them with her myself. This exercise teaches body and hind leg awareness. The gym instructor created a chute with an X-pen and enticed her with a treat. Asked her to walk in and then back out in one fluid movement. Started with going in just a little and then increased the depth. Once Gretel got down what she was being asked to do, we progressed to asking her to back up to a target with no walls on either side of her. This exercise strengthens the core and chest muscles. Like the paws up but with the back legs. Get her into position by using a cookie to get her to walk up and over the K9 FITbone. Have her stop once her front legs are on the ground but her back legs are still up on the bone. The video below shows a similar, easier exercise done using a yoga mat instead of the higher FITbone. If you are not familiar, these are like small horse jumps with several in a row. The goal is to get your dog to step over them one leg at a time – first front, second front, first back, second back – without hopping or jumping. It teaches them body awareness and to pay attention to what their feet are doing. Also, to pick up/bend their back legs instead of walking stiff-legged and swinging them around to the outside of the hips (like Gretel used to do). I started with 1 1/2″ PVC pipe laid on the ground and then progressed to poles elevated about 3 inches off of the ground (link to set). 4 – 6 poles placed as far apart at the dog is tall at the shoulders (we started with them farther apart until she got the exercise and then moved them closer together – the goal being for her to be moving a front and back leg at the same time. This exercise strengthens the rear legs. It’s pretty simple. We started on the floor and then moved to doing it on the K9 FITbone. I make her sit and then stand, ideally without taking a step forward. The key here is to get her to use her back legs to push herself up instead of her front legs to pull her up. It helped when I put my hand on her chest so she couldn’t move forward to stand up. This exercise strengthens the core and hindquarters. I place her front paws on an unstable surface, elevated about 4 – 6″ off the ground. We started with the easier K9 FITbone and progressed to the mini egg. The idea is to encourage a weight shift to her rear legs. Her head should be held up and her back should be straight. This exercise strengthens the core and enhances body awareness. 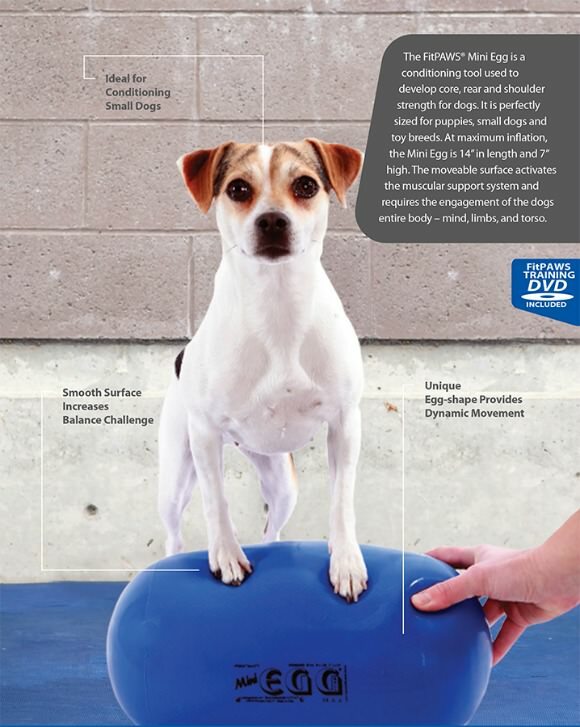 For this exercise, the dog places their front paws on a balance disk, which elevates their feet 2 – 3 ” off the ground, and then pivots their back-end around that point. It forces them to do a side-step. Strengthens the core muscles, rear muscles and chest muscles. Do the paws up exercise and hold for 10 – 15 seconds. Then have them walk over the FITbone so they are in the rear paw target position. Hold that for 10 – 15 seconds. You can then have them step down, walk around the bone, and then start over. To make the exercise more difficult, you can use a cookie to get them to back up and put both their front and back feet on the bone, and then back up some more to step their back feet off. This exercise strengthens the core. It’s done on an unstable surface like the K9 FITbone, disk, or donut. It’s important to keep her topline (back) straight and neutral and be standing on her paws, not squatting or resting on their wrist or ankles. For this exercise, it’s about standing properly and balancing on an unstable surface. This exercise strengthens her core and improves balance. This starts by her standing on an unstable surface as above. Then I gently lift one paw at a time. The goal is to get her to shift her weight to the other three paws and not push on my hand to hold herself up or balance. This is done with both front and back legs. We started out with easier exercises for short periods. As Gretel progressed, the exercise difficulty was increased. We extended the time she was doing the original exercises and added more challenging ones into the routine. This is a long list of exercises. At first, I thought I was supposed to do all of them 5 times a week. There was no way I was going to be able to fit that into my schedule! After thinking about what would be realistic for me, and discussing the expectations with her rehab vet, I settled on a balance that could work. My long-term goal is to do 2 – 3 of these exercises with her per session and to 2 – 3 sessions a week. I always thought Gretel was strong (she IS) so I wasn’t sure these exercises were going to help her much. However, she wasn’t strong in a balanced way. Now both of her thighs are the same size when the rehab vet measures them. The circumference of her thighs has increased 1 cm since starting the exercises, which is a lot for a little dog. I’ve also noticed that her gait has improved and she’s moving in a more mechanically correct way. I’ll be honest. It is still hard to consistently fit them into my schedule though. I need to make improvements in my own health that involve cooking for myself, yoga, and regular exercise, all which also compete for my time. I’m practicing not being hard on myself and celebrating the times I AM able to get all of her exercises in for the week. As she is, this habit is also a work in progress. Do You Need to Treat Your IVDD Dog Like Breakable Glass? It’s really helpful to see the videos of Gretel’s exercises. Thanks for sharing them! I love seeing her progress! I’ve done a lot of the types of exercises with Nola; she’s especially fond of the Donut! Cool! We do all of these exercises with Archer in his Sport Dog class. He doesn’t have the best balance nor the strongest core, but we have a great time stretching, trying to balance on fit bones/giant peanuts, and learning to walk backwards. I’m glad Gretel is getting stronger with her balance. Hopefully this helps prevent re-injury. Linus is the athlete in our house. He’d excel at the sport dog class or agility class. So far I’ve only had one athletic Lab, Derby. All the others have been stocky and not too coordinated. When did you start the excerises? After crate for 6 weeks or sooner. My little guy had injury 5 days ago. Hi Sara. Gretel was under strict supervision by a rehabilitation specialist. She’s the one that determined when it was safe for Gretel to start exercises. I think we started hydrotherapy after week 2 and added in these “gym” exercises in small doses the week after. My dog had his first IVDD episode and surgery 4 weeks ago and I’m thinking about getting some balance equipment to do exercises with once he’s cleared for that kind of activity. Which pieces of equipment would you say are the most worth it? I was thinking about getting a K9 FitBONE and a generic 14″ balance disc. Do you think this is a good place to start? Hi Jessica. Sorry to hear about your pup. I do really like the Balance Bone to start with. You can use it for so many exercises and you can make them harder or easier depending on how much air you put in it. The balance disk is also great for beginners because it’s low to the ground. That way your pup can’t re-injure themselves if they “fall off”. It’s small enough in diameter that it can be used for rotational exercises like pivot too. Good luck to you guys and thanks for reading my blog. Hi Eva. I’m sorry to hear about your Sister’s dog. I’m not a vet but, in my opinion, as long as the dog is tall enough to get on and off the cot without any impact (like stepping up or jumping off) laying on the cot might actually be a good thing. It’s easier on the joints than laying on a hard surface like the floor. Otherwise, an orthopedic memory foam bed might be comfortable. I don’t have a specific brand of those types of beds to recommend though.